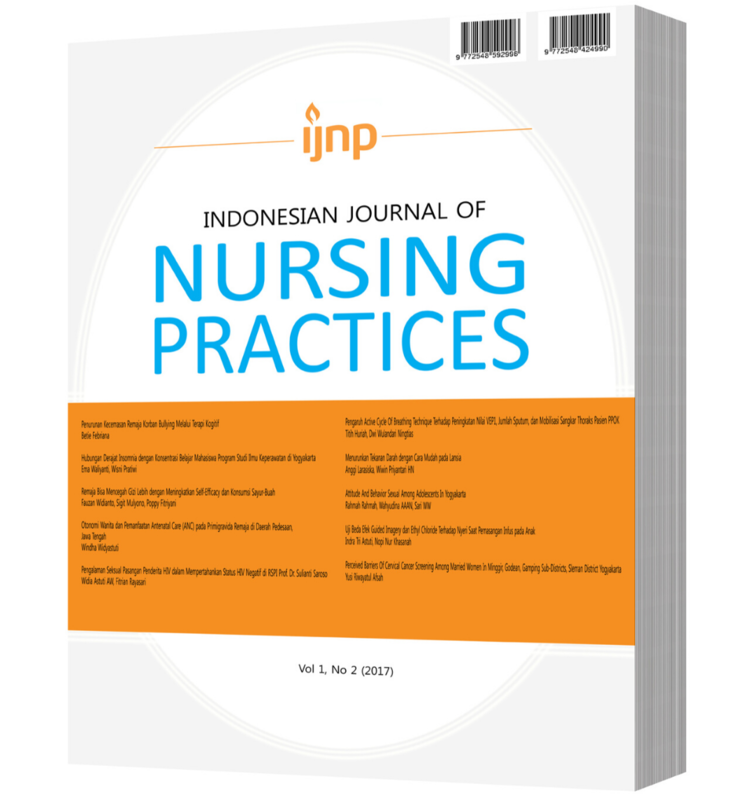 IJNP (Indonesian Journal of Nursing Practices) is a bilingual journal published by Universitas Muhammadiyah Yogyakarta, PPNI (Persatuan Perawat Nasional Indonesia) and AIPNEMA (Asosiasi Institusi Penyelenggara Pendidikan Ners Muhammadiyah). IJNP is published semi-annual (June and December) since 2014. This journal before named Muhammadiyah Journal of Nursing with ISSN print 2356-1114. Then, since 2016, this journal changed to IJNP (Indonesian Journal of Nursing Practices) with ISSN online 2548-592X and ISSN print 2548-4249. As a peer-reviewed Indonesian journal, it welcomes any papers of research about Islamic nursing written in English and Bahasa Indonesia. IJNP continues to be consistent in publishing scientific articles, both research and reviewed articles. IJNP publishes both printed (book) and electronic (PDF) versions. Electronic articles are accessible openly on the web page: http://journal.umy.ac.id/index.php/ijnp. ISSN: 2548 4249 (Print) 2548 592X (Online). Article submissions in IJNP (Indonesian Journal of Nursing Practices) is done through OJS or online submissions (not by email). Pengajuan artikel di IJNP (Indonesian Journal of Nursing Practices)dilakukan melalui pengajuan online (tidak melalui email/surat elektronik). Pedriatric Population in Disaster: How Should We Care for Them? Indonesian Journal of Nursing Practice is licensed under a Creative Commons Attribution 4.0 International License.